This article was updated Feb. 23 to reflect the fact that Iceye will maintain control of its radar. After passing its critical design review, where representatives of the U.S. Army Space and Missile Systems Defense Command and other government agencies confirmed that the Harbinger mission was on track to meet government requirements, York is now ready to begin building and integrating components of the satellite, which it plans to launch Nov. 15 on a rocket it has not yet disclosed. York has 90 letters of intent or formal agreements with commercial and government customers who intend to purchase its S-class satellites, which are designed to carry payloads of 85 kilograms or less, York Chief Executive Dirk Wallinger told SpaceNews, adding that approximately 60 percent of those expressions of interest come from U.S. government agencies. That’s significant because U.S. military leaders have talked for years about deploying constellations of inexpensive small satellites that could be launched quickly in response to threats but haven’t purchased many of them. (One exception is the U.S. Army’s Kestrel Eye microsatellite built by Adcole Maryland Aerospace.) Wallinger sees that changing. “We are seeing a groundswell of government interest,” he said Feb. 21. York is currently buying long lead items and establishing a production line for the three-axis stabilized S-class satellites it sells for $675,000 to $1.6 million, based on options customers select. Customers can choose, for example, to equip spacecraft with electric propulsion, enhanced power systems and laser communications downlinks. The Harbinger mission, which weighs in at 150 kilograms including its 65-kilogram bus, features Iceye of Finland’s synthetic aperture radar, Denver-based BridgeSat’s optical communications and Enpulsion of Austria’s Field Emission Electric Propulsion. Iceye, Bridgesat and Enpulsion participated in the Harbinger mission’s critical design review, demonstrating to government customers that their technologies should be cleared for fabrication and integration. Either way, York intends to fundamentally change the cost curve for satellites by offering customers a standard product that meets about 80 percent of their requirements instead of customizing each spacecraft for its particular mission. “People don’t understand it’s the engineering, not the hardware, that makes satellites expensive,” Wallinger said. In November, York began moving into its automated manufacturing facility at Metropolitan State University’s Denver campus. 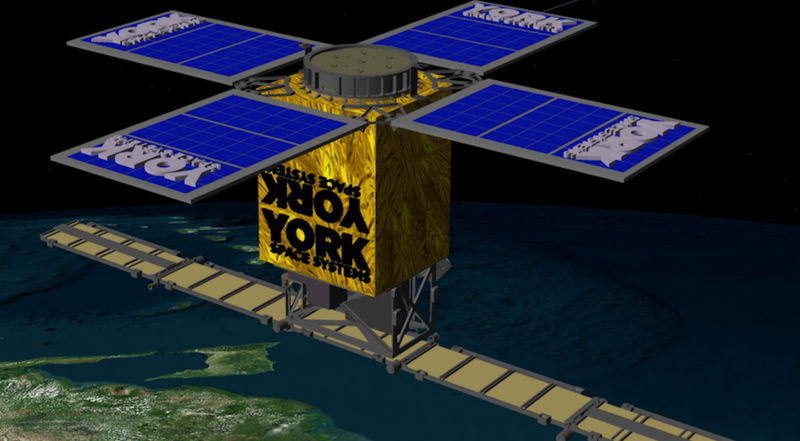 Once that facility is operating at full capacity, York plans to build 200 satellites per year and offer customers next-day delivery. As it sets up shop, York is preparing to expand its workforce from its current staff of 14 to 20. York attracted attention in March 2017 when it hired Chuck Beames, former president of Vulcan Aerospace, as its executive chairman and chief strategy officer. In August 2017, York hired Rob Baltrum, a veteran Ball Aerospace & Technologies Corp. engineer, to become its engineering vice president. “I’m confident in the team and in the team’s ability to execute,” Wallinger said.